The Volkswagen Eos utilizes a crankshaft position sensor in order to regulate the engine timing. This sensor uses a reluctor to gauge the position of the crank. When the Eos’s ECM determines that there is an issue with the signal coming from this sensor, it’ll throw the P0335 trouble code. 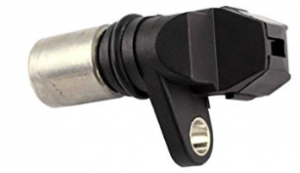 Depending on the model year and engine of any vehicle the job of the crankshaft sensor is going to change.It’s either going to provide info to the ECM to keep the vehicle from misfiring. Or, it’ll provide necessary data to keep the engine timing in order. Often, if the crankshaft sensor or wiring itself is bad, there won’t be any RPM reading form the tachometer. Most of the time, the crankshaft sensor is going to be the cause of P0335, or the wiring will be at fault. There are other causes as well.There’s more on that directly below. The crankshaft sensor is often the reason that P0335 is thrown. They aren’t very expensive, but they can be difficult to get to in order to service them. If you think you’re up to the challenge (and know how to use a volt meter) this guide from doityourself.com will show you exactly how to test the sensor. One of the most common symptoms of a bad reluctor ring is going to be a rattling sound. If the engine still runs, you will hear it. This means that it has been damaged, and no longer seated properly. Due to the location of the crankshaft position sensor, it is prone to damage. Start by inspecting the wiring harness between the firewall and crank sensor for any obvious damage. After that it would be prudent to look at the wiring harness plug at the sensor itself. This YouTube video shows exactly how to test the wiring integrity. Timing Belt/Chain– It is possible that a vehicle that has jumped timing is throwing the code. Here’s more on diagnosing a bad timing chainfrom this site. PCM/ECM– When the vehicle’s ECM goes bad, it can throw false trouble codes. This is definitely not the place to start, but is worth looking at if nothing else seems to be wrong. Symptoms of a bad ECM (Autoblog). Good luck determining what is causing P0335 in your Eos. If you feel like there is anything you would like to add, please leave a comment below.